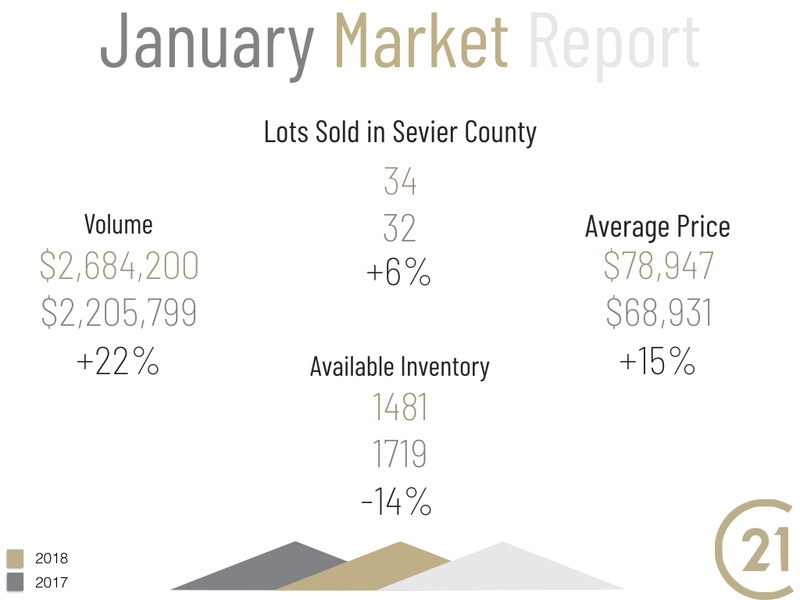 129 homes sold in Sevier County in January of 2019. 145 homes sold in January of 2018. Average price has increased by 26% and is up by $61,000. Available Inventory is down 17%, but Volume up by 13%. 17 homes sold in Gatlinburg in January of 2019. 28 homes sold in January of 2018. Sales are down by 39%. Average price has increased by 49% and is up by $105,000. Available Inventory is down 33%, and Volume down by 9%. 26 homes sold in Pigeon Forge in January of 2019. 29 homes sold in January of 2018. Average price has increased by 61% and is up by $147,000. Available Inventory is down 32%, and Volume up by 44%. 37 homes sold in Sevierville in January of 2019. 39 homes sold in January of 2018. Average price has increased by 6% and is up by $13,000. Available Inventory is down 10%, and Volume is flat. 3 homes sold on Douglas Lake in January of 2019. 6 homes sold in January of 2018. Average price has increased by 11%, and is up by $17,000. Available Inventory is up 2%, and Volume down by 45%. 7 homes sold in Wears Valley in January of 2019. 10 homes sold in January of 2018. Average price has decreased by 1% and is down by $4,000. Available Inventory is down 27%, and Volume down by 31%. 8 homes sold in Seymour in January of 2019. Sales are down by 20%. Average price has increased by 36% and is up by $70,000. 34 lots sold in Sevier County in January of 2019. 32 lots sold in January of 2018. Sales are up by 6%. Average price has increased by 15% and is up by $10,000. Available Inventory is down 14%, and Volume up by 22%. 8 lots sold in Gatlinburg in January of 2019. 5 lots sold in January of 2018. Average price has decreased by 9% and is down by $2,000. Available Inventory is down by 2%, and Volume up by 46%. 4 lots sold in Chalet Village in January of 2019. 3 lots sold in January of 2018. Average price has increased by 31% and is up by $49,000. Available Inventory is down by 28%, and Volume up by 31%. 1 lots sold in Pigeon Forge in January of 2019. 2 lots sold in January of 2018. Sales are down by 50%. Average price has decreased by 41% and is down by $37,000. Available Inventory is down 16%, and Volume down by 70%. 6 lots sold in Sevierville in January of 2019. 9 lots sold in January of 2018. Sales are down by 33%. Average price has increased by 402% and is up by $109,000. Available Inventory is down by 7%, and Volume up by 235%. * A 90 acre lot sold for $914,000 this month. No lots were sold on Douglas lake this month. 3 lots sold in Wears Valley in January of 2019. Average price has increased by 19% and is up by $9,000.